“Doors of Heavens” is the novel that I have decided to write for my thesis. This novel is a story comprised of many other stories. They have different moods, pulses and beats similar to the music that I have always adored – rock ‘n’ roll. But this is also a poetic analogy and devotion to the passion, spirit and the thrill, of being a small particle within the great idea of the human and liberal sciences. A devotion to the spirit and the thrill I was inspired by as a student at the University of Chicago. Before I begin with the introduction to the “Doors of Heavens,” I would like to reveal the roots and the reason for my choosing this particular topic. This, I hope, could provide the readers with understanding of the feeling that was hidden inside of me, and was pushing and bothering me, teasing and tormenting me for a long time, until the moment I sat and expressed it in writing. 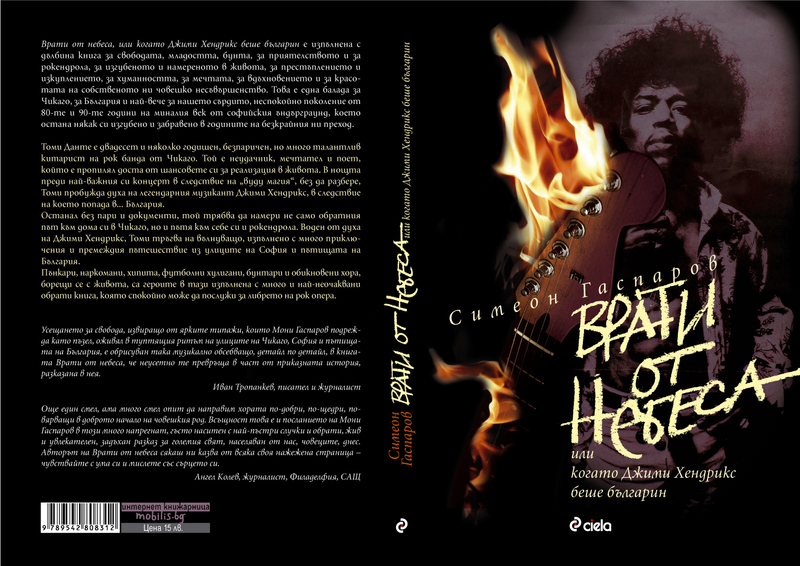 The introductory essay about the essence of the “Doors of Heavens” I named “When Jimi Hendrix was Bulgarian.” (Oh, yeah, I can see the suspicious smiles!) How come? What does Jimi Hendrix, an American, black rock musician have in common with an Eastern European country that you can’t even find on the map? It was somewhere in the beginning of the 1970s. I was a kid, living in the lonesome, odd, quaint, erratic and misunderstood Bulgaria. It was one of those last hot sleepy summer days of school vacation. My friends and I, living in a blue collar neighborhood of Sofia, did not have many chances in front of us. But we also did not have, many things to worry about it. While our parents were working in the nearby factories, we were spending our days playing soccer, breaking the windows of houses with the soccer ball, repairing our rusty bicycles, stealing plums, peaches, apricots and apples from the green orchards around and waiting for the time when we would grow up and, like our parents, be swallowed by the same surrounding factories. Tags: "Doors of Heavens or when Jimi Hendrix was Bulgarian"